I quite agree. Many things have been lost, but also some of our greatest archaeological finds have been found this way and ended up in the correct place. However, you would be surprised at the variation in quality in archaeological protection/recovery just across this country? The report says that the remains of mail were "clearly discernible" which as you say may just mean some kind of impression found in the soil. It doesn't say who the person investigating was, so his interpretation of what was seen could be very inaccurate. Unfortunately this was at a time when excavation techniques were generally pretty basic and despite a few highly talented amateurs there was no such thing a professional archaeologist. There were lots of wonderful Roman sites discovered during the expansion of London during this period, most of them just given a cursory look by some local antiquarian, often looted and destroyed and with only some of the most choice objects finding their way into private collections. By then they had lost any historical context they may have had regarding their origin. It makes you weep to think how much of our history has been lost in this manner. Thankfully these days investigations are much more careful and thorough, although I sometimes wonder what future archaeologists will think of present methods. Will they regard them as equally crude? It is possible they are two separate events as I'm sure there was a lot of building work occurring in the Star Hill area during the mid nineteenth-century? In support of the Anglo-Saxon (Jutish) grave theory, the person credited in the listing extract (Mr Payne) was none other than Mr George Payne, who was one of the founding archaeologist of his time in the Rochester and Medway area. I would be surprised if he was not aware of any other burials being unearthed in the area without including them or at least commenting on them? The fact that burials of Anglo -Saxon date were found in the Star Hill area, of which grave goods from the encountered burials are recorded as being in Rochester Museum, would suggest they form part of a much larger cemetery (you rarely find small localised groups of burials of this date). If the initial eight skeletons were encountered during the construction of a single 'house' on Star Hill in September this may have been the catalyst for further investigation during adjacent constructions with a total being twenty, or more, (the listing says 'no less than twenty'), a total of which may include the initial eight? In relation to the medieval burial line, it is possible these initial eight represent a separate discovery, predating by a month, the work of Mr George Payne and not included on the official listing? Though it is very possible this is the case, I would call into question the discovery of chain mail as the nature of the underlying soils of the area is very unkind to iron especially. It is possible this reference to chain mail could be a misinterpretation by the reporter of some other decayed object placed over the burials, though without seeing it we can only go on what is published. It is not impossible for chain mail to survive (see the Battle of Visby c.1361) where a series of mass grave were excavated, which included those slain in the battle, many still wearing scale, plate armour and chain mail. If these initial eight graves were of a medieval date, then they would have been buried very soon after they had fallen leaving them wearing their personal protection. As far as I'm aware there are no recorded burials like this in the British Isles, though small amounts of chain mail scraps and armour have been found? CAT, I'm not sure if these are the same burials. The report says "a house" on Star Hill rather than cottages at the foot, eight skeletons rather than twenty and September rather than October. Chain mail suggests Medieval to me but this may just be a case of misinterpretation. I'm not sure how strict the fact checking was in those days, but if it's anything like it is now it may be a bit suspect, to say the least. 'Not less than twenty Saxon burials with spearheads, armillae, etc., were found by workmen in October 1852 during the building of cottages at the foot of Star Hill, Eastgate, Rochester. Mr Payne mentions the discovery of "several Jutish graves" when Orange Terrace was built in 1852, and "the cottages at the foot of Star Hill" would appear to be one and the same On this assumption, the Jutish burial ground has been sited to the area centred TQ 74666807. Finds from the cemetery are in Rochester Museum'. Not sure about the reference to chain mail, which would have been available, but largely outdated by the mid seventeenth-century due to improvements in weaponry, namely the invention of firearms. So a Civil war period skirmish in the Star Hill area? 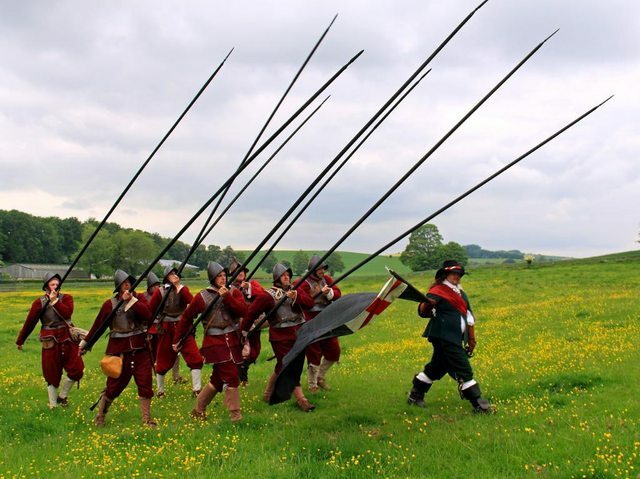 Here's the explanation for the spears, or pikes as they are known. A cursory glance through the net failed to find references to chain mail. Came across this report in the South Eastern Gazette from September 1852. By Commonwealth, I assume the reference is to the Civil War, although how the presence of chain mail and spears fits in with this is not explained.